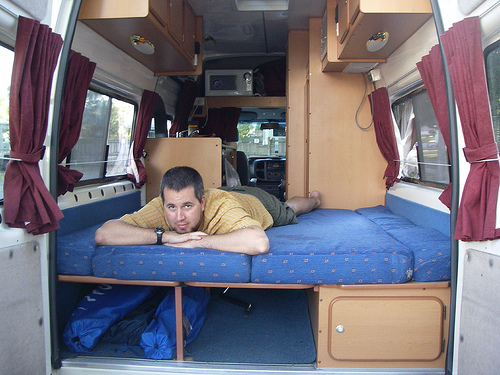 Squeak is an Apollo brand campervan 2-berth (sleeps 2 adults) that is about 3 meters (9 ft) high and 5.5 meters (17ft) long. No Mickey D’s drive through’s! It fits almost exactly end to end in a normal parking space. 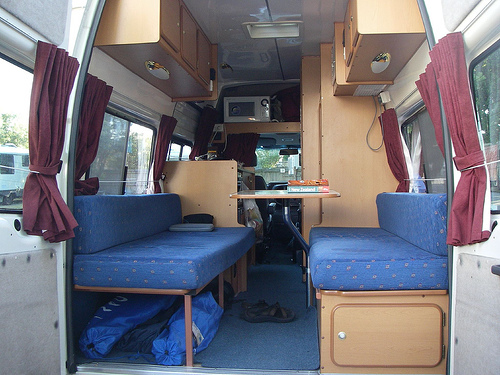 This is the back of the van with a bench-like set up including a swivel table. The tabletop is placed between the benches and with two other similar boards, a solid platform is created for a bed. 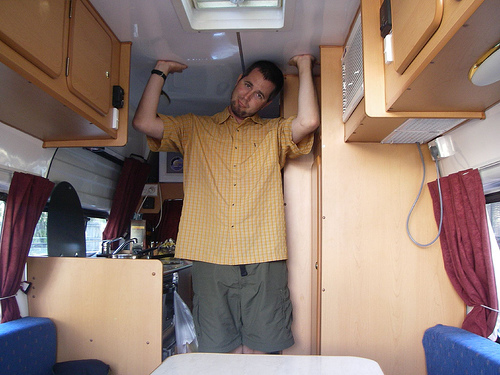 It’s pretty wide and Lee – at 6’3” – doesn’t hang off the end…Though he is too tall for the ceiling, unless he stands under the top vent. Further up is a gas stove, sink, mini fridge, and mini oven on the left and a closet and toilet/shower on the right. The microwave and air conditioner are also tucked high in the corners. 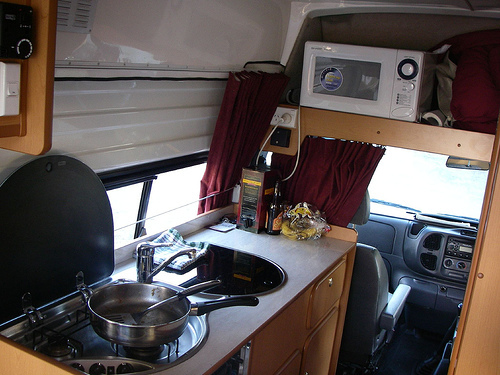 There are cabinets everywhere and they hold the linens and kitchen pots and utensils that come with the van. What we didn’t expect was the cabinets to squeak at every turn and with every swaying movement of the vehicle. Think squeaking plastic rubbing together. The other noise is an inevitable closet door spilling open or bananas falling on the floor at the first turn of every drive. We try to remember to close all the knobs to lock the drawers in place and be sure to close the windows and the overhead vent, and then be sure everything on the sink or table has been put away…but we have almost always forgotten something. Then we start the engine and boom – this morning it was Lee’s clothes cabinet door that spilled the stack. Two days ago the entire utensil drawer littered the floor (Lee opened that one). Is there a trend here? The cabinet doors squeak even louder when they are flying open. Good thing we’re now in the Wellington area where there are radio stations to turn up and loud for the ride. Sachi insisted that I be the model, as she is so often by model. It's got a shower? Boy, you guys really know how to rough it. It does, but it's a bit of a sardine can for me. 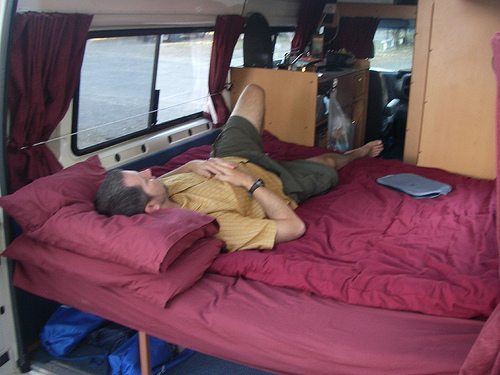 Most of the time we shaower at the campgrounds and at friends' houses. Starting the first drive of the day, Lee pulling onto the road and Sachi standing in the middle of Squeak trying to anticipate which drawer or item off the counter will open/fall/break/etc and trying to catch it before it happens. It's like that kids arcade game where you have a mallet and you try to bonk the mole popping his head out of the hole. you have to be fast and move the moment something starts to move. Great photos!! Mark, you're right, it is a bit like that, but it's more of a cautious look back from the passenger seat. Mom- we should do a post on food! It's been quite good eating from the campervan... the monetorium is still in effect so we eat almost every meal in Squeak.